Borg and Qverström provide high quality water refreshment systems across the world. We pride ourselves with maintaining a high standard and consistent corporate approach to everything...Read moreBorg and Qverström provide high quality water refreshment systems across the world. We pride ourselves with maintaining a high standard and consistent corporate approach to everything we do. 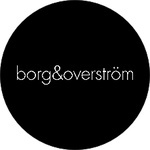 There are a few staff at Borg & Overström who use this account. So you could be speaking to any of us. We will only be "buying" on PPH and one thing we expect is the same high standard and consistent corporate approach in all work we buy. See our websites www.borgandoverstrom.com for further information about the company.